A new high-end scanner on the first floor has been installed on a trial basis. We invite students, staff, faculty and visitors to help us test it out. 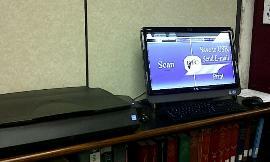 The large flatbed (book edge) scanner and accompanying PC with touch screen interface are easy to use. The software can even convert text to audio. You’ll find the trial scanner near the public print station on the first floor of the Library. Feedback forms are available. Give it a try and tell us what you think!